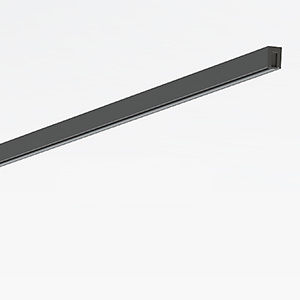 LIFELINE™ is a refined and minimalist track lighting system that can accommodate two luminaires specially designed for PIXIS™ and MILI™. Field-cuttable it encompasses near invisible integration, ingenious connectivity, and simplified installation. We have designed the whole track system for being as miniature as possible and invisibleonce integrates into the shelf. Thanks to its magnetic connectivity, placing the lighting fixtures is a child’s play and safe. Vertical, horizontal or sloping surface, recessed or surface mounted, it’s needless to say the two luminaires PIXIS™ and MILI™ slide freely all along and can be repositioned unrestrictly to create new ambiance easily. 48” length (1.2 m) – 20 AWG wire lead with WAGO quick connector. High precision thin walled aluminum extrusion. Integrated metal strip allows for quick and easy magnetic installation of mating lighting products. Product can then slide freely all along the LIFELINE™ system for unrestricted positioning.